Recently I was gifted several mechanical pencils from someone who is a fan of larger lead sizes, and they were attempting to convert me. I have to say I’m not convinced, but the pencils themselves were ones I hadn’t had previous experience with. That isn’t really surprising, considering the vast array of mechanical pencils on the market from companies like Pentel, such as the gift I’m looking at today: the Pentel Sharplet-2 in .9mm. The pencil has a very classic and simple design that’s been around the block. 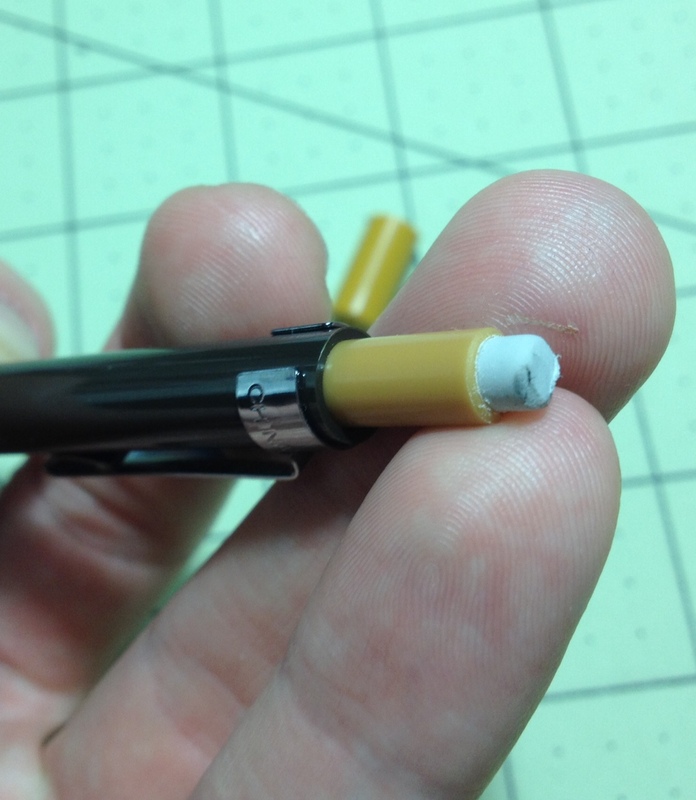 At the back there is a plastic, cylindrical cover for the eraser, which is the standard tiny variety and placed over the lead tube. This back bit also serves as the click-advance mechanism. The barrel is the same diameter as the back cover, and consistent all the way down. The clip is one piece of metal that is friction fit around the barrel; it is a little stiff but keeps the pencil where you clip it. The only other features of the barrel are the brand and model information (that is engraved in as well as painted on, making it harder to wear away than on most writing implements), and about an inch of tiny ridges on the “section” (there is no separate section so that is for you to decide) for grip. 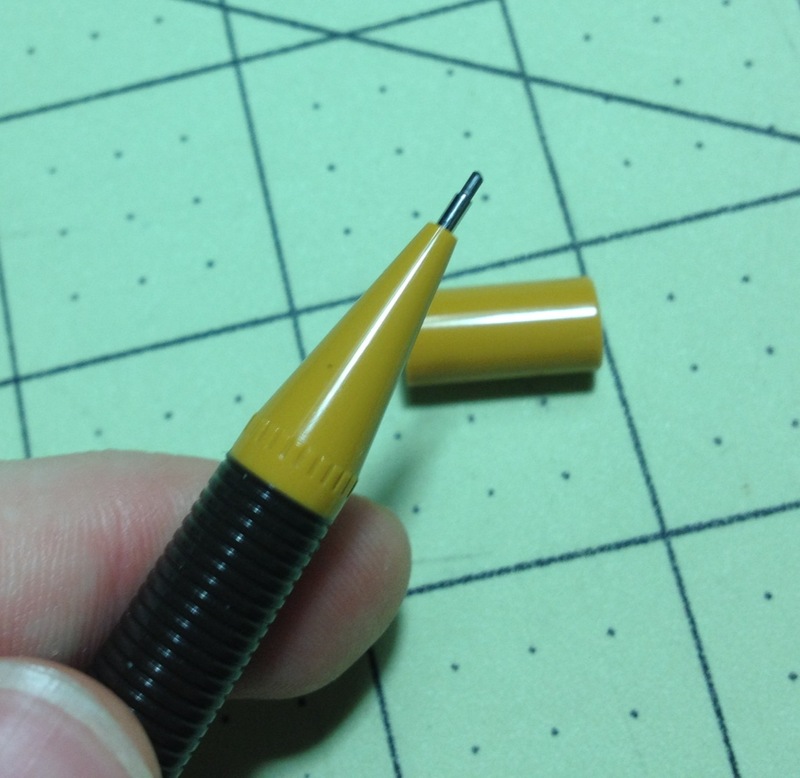 The plastic cone that screws on the front is straight and unspectacular, ending in a metal pipe that makes the pencil more drafting-friendly. The leads pencils normally come with are all pretty standard, straddling the line between super dark and super light. The wider leads, just by virtue of being larger, require less pressure to write darker, and write (or sketch) in general with a wider and darker line. There are no real problems or tricks one has to get used to when writing. The eraser is similarly plain. It erases well, but can have trouble getting rid of darker or thicker lines like all erasers of its size that come packed in with mechanical pencils. The pencil does come in different versions for lead sizes; these are color coded for easy identification (it looks like there is some variation in the eraser color, as well). 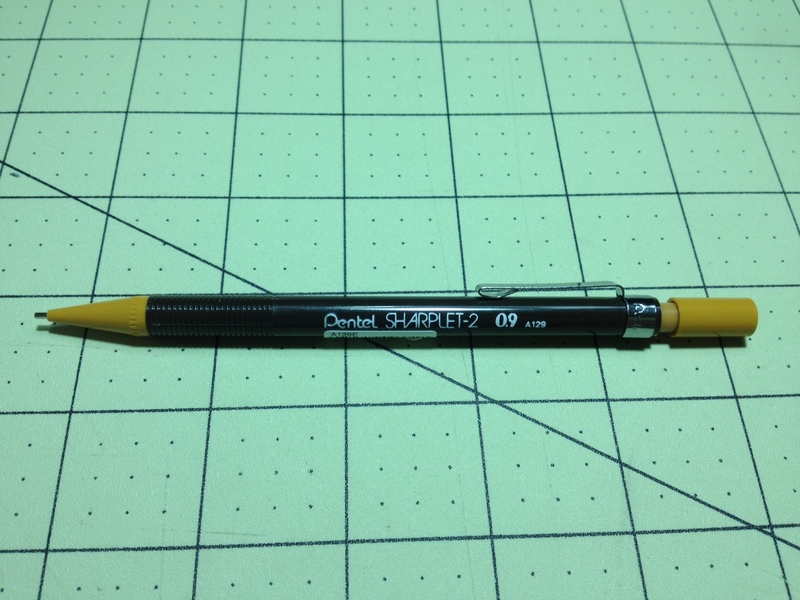 Pentel makes a solid pencil, and this is no exception. The design is simple, comfortable, and durable. It’s really a no-frills pencil. Everything is basic and has a function, it’s easy to disassemble and parts could be easily replaced (though it isn’t expensive enough to justify the hassle of that, it certainly isn’t a disposable pencil, though). The mechanism is satisfying to use, the grip is not slippery, the clip holds, and the retro styling makes it look kinda trendy (not that I care). If you want a simple, solid pencil or want to buy a set with easily distinguishable lead sizes, these would fit the bill. This entry was posted in Intermediate Supplies, Utensils and tagged 0.9mm, art supply, art supply critic, art supply review, color coded, easy, inexpensive, Intermediate, large lead, larger size, lead, mechanical pencil, pencil, pentel, pentel sharplet, pentel sharplet-2, refill, review, sharplet, sharplet-2, simple by Dragon Co (Austin Smith). Bookmark the permalink.